Vancouver Housing Crash Could Be Bad. It Could Be Good, Too. "There's people like me who need homes still, and will buy them if they become available." 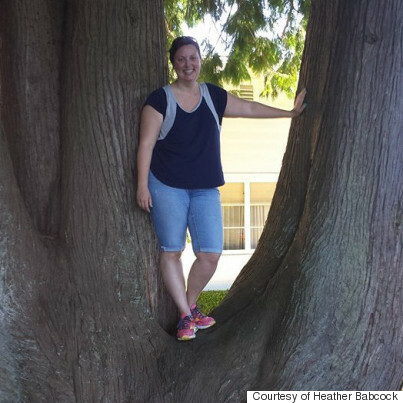 Heather Babcock's old neighbourhood is a difficult place to be nostalgic. The English and dance teacher at Vancouver's Windermere Secondary grew up in the Dunbar area on the city's west side. She recalls a busy community on the edge of a vast forest, where houses looked like cabins and kids played hockey and "Kick the Can" in the street. One of her fondest memories is using a tree across from her home as "home base" in games of tag. But the area has transformed into something less idyllic than she remembers as home prices have kept shooting up around the city. Many cabin-like houses have been replaced by "gigantic" homes that push the limits of what their lots can bear. She feels thankful that her old home, now sold, has only been painted on the outside and not torn down altogether. "When I was still living there, they were knocked down and replaced by people who intended to live in them," she told The Huffington Post Canada. "When I go back now there’s a few I can tell that are empty." But there are signs now that the feverish activity that has dominated the city's real estate in recent years may finally be slowing down. Greater Vancouver home sales have been falling for four months. On the west side alone, sales of detached homes have dropped for the last three, even as supply remains stable. A housing crash is now emerging as a very real possibility. And Babcock, who has rented a two-bedroom apartment that overlooks an alley for 13 years now, admits she's "super looking forward to one" because it would help her buy a place. "I'm looking forward to a crash for my own selfish reasons," she told The Huffington Post Canada, laughing. But how deep could housing fall? And how tough would it be on Vancouver and B.C. 's economies? How bad would a crash be? 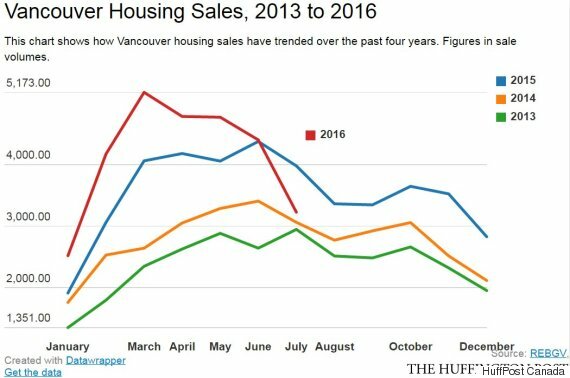 A housing crash has long been predicted in Vancouver at varying degrees of severity. Estimates of one range anywhere from a 10 to 50 per cent price correction. What many agree on, however, is just how important the sector is to Vancouver and B.C. 's economies. 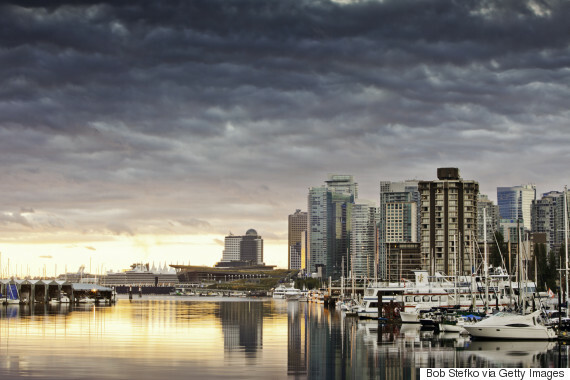 Three years ago, Ontario-based housing bear Ben Rabidoux told a packed audience at the Vancouver Convention Centre that a housing crash poses a looming threat to Canada's economy. He noted that housing-related industries such as real estate, construction, finance and insurance had become outsized contributors to Canada's GDP and job market, and that those industries would "see a hit to their income" if sales and prices fell. "If sales remain slow, it's hard to envision developers launching new projects with high unsold inventory, low sales and lots of units currently under construction," Rabidoux said at the time. The construction sector, he said, could bleed as many as 180,000 jobs across Canada if it returned to its long-term proportion of employment. And a reliance on housing-related industries, he said, was "most pronounced in B.C." 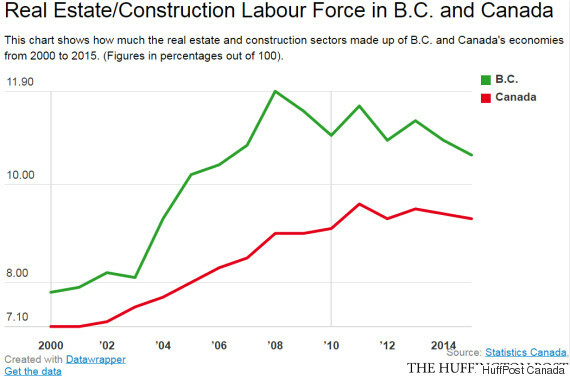 Construction and real estate together made up approximately 10.6 per cent of B.C. 's total employment last year. Across Canada, they contributed about 9.3 per cent. Look back to the year 2000 and you see that construction has grown to become B.C. 's third-biggest industry. It used to be seventh. 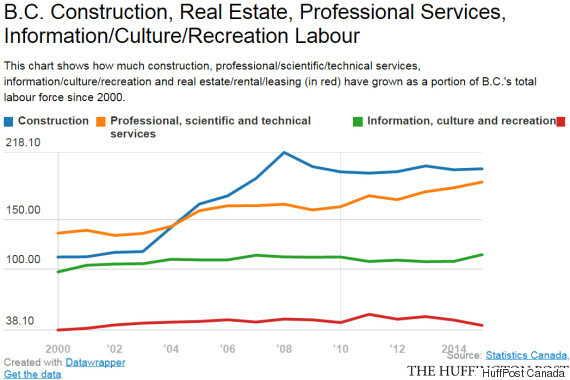 Now, construction, as a sector, isn't driven by homebuilding alone. It also accounts for non-residential buildings and energy projects. Indeed, much of the run-up in construction employment between 2002 and 2008 was due to non-residential builds. But home construction helped to keep it at a consistently high level since then. 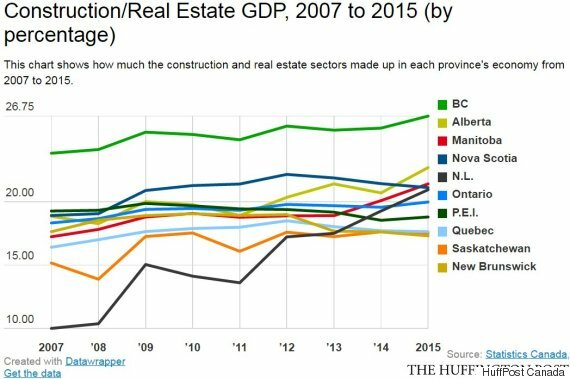 Real estate and construction also loom large in B.C. when you look at how they contribute to GDP. 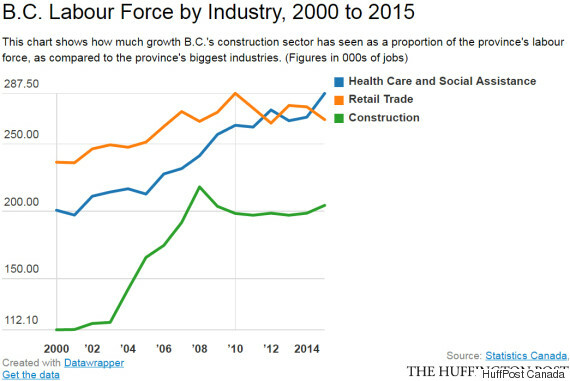 Together, construction and real estate made up 26.75 per cent of B.C. 's economy last year. This was more than in any other province — the next closest was Alberta, where those sectors accounted for 22.69 per cent of GDP. 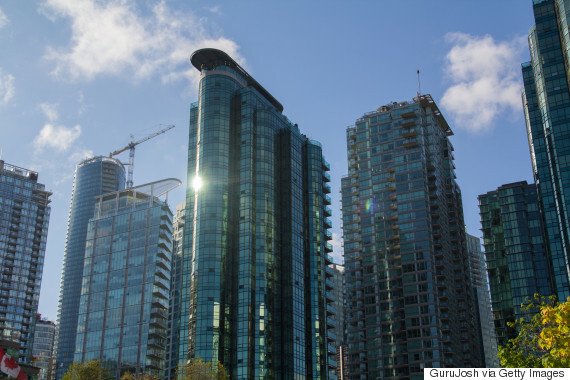 That level of dependence on real estate-related industries is "insane," said Andrey Pavlov, a specialist in real estate finance at Vancouver's Simon Fraser University (SFU). But even that doesn't likely capture the full extent of how much B.C. 's economy is tied to housing, he told The Huffington Post Canada. Add in the finance and insurance industries, and real estate-related sectors touch approximately 35 per cent of the economy, by his estimate. The prospect of a real estate crash concerns Pavlov because, in his view, Vancouver doesn't have much else going on economically. And he sees a crash of 50 per cent as entirely likely because prices are so far out of whack with local incomes. A city with a diversified economy, like New York or San Francisco, can ride out a crash fairly easily, he said. 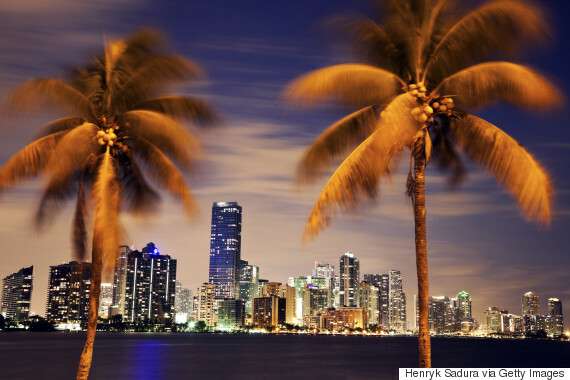 But he compares Vancouver to Miami, where real estate was the dominant industry before the 2008 financial crisis, and where house prices fell by half when the bust hit. Unemployment there subsequently shot up to 11.6 per cent, a level it hadn't reached in 19 years. "If all you have is real estate, then it's tough," he said. Pavlov sees four factors that, together, bode ill for Vancouver housing. The first is the 15 per cent Property Transfer Tax on foreign buyers that B.C. announced in late July. It has already been connected to an estimated 75 per cent drop in detached home sales in the weeks since it was unveiled — and sales had already been falling all over the city before that. The tax is unlikely to trigger a crash on its own. But combine it with another, proposed tax on empty Vancouver homes; a Revenue Canada crackdown on tax evasion and banks tightening their mortgage lending, and "that's now starting to add up," Pavlov said. He sees a crash being most pronounced among high-end properties, though he's not sure what will happen among median-priced homes. "But the extreme high prices can easily come down by half," Pavlov said. You find a more optimistic view of the housing market when you talk to Diana Petramala with TD Economics. She thinks it's more likely that the Vancouver market will crash by 10 per cent, creating a downturn similar to what happened in 2012, after the federal government instituted new mortgage rules that reduced the maximum amortization period from 30 years to 25 years — and the province's economy "barely blinked an eye to it." Petramala sees a 50 per cent contraction as unlikely because, for one thing, it's never happened in Vancouver. She said B.C. 's employment doesn't depend entirely on housing. And the province's labour market is quite strong, according to her. Industries such as "information, culture and recreation," which includes film production, as well as "professional, scientific and technical services," which includes scientific research, are also "doing really well," she noted. Indeed, both these areas have grown as a share of B.C. 's labour force in recent years. But Petramala nevertheless agreed that real estate has a significant influence on B.C. 's economy. If, for example, a crash yanked B.C. 's construction employment down its long-term proportion of the labour force, it could mean the loss of as many as 46,000 jobs, consistent with Rabidoux's analysis. But it would also touch other industries, such as retail, she said. A TD report published last year showed that a homeowner's consumption rises five cents for every dollar that a Canadian home's value goes up, giving them more money to shop with. A housing crash would have the opposite effect, reducing consumer spending and harming the economy. Would a crash be so bad? But Petramala also doesn't think a crash, such as the one she's envisioning, would be so bad for Vancouver. In fact, if it were to happen now, she thinks it might be good for the city in the long term. A price drop of approximately 10 per cent would bring home prices more into line with incomes, she said, and help to keep a younger workforce in the city. She noted that B.C. 's price-to-income ratio has fluctuated over the past three decades. TD Economics' B.C. Housing Affordability Index, posted above, shows the price-to-income ratio shifting above and below the long-term average and settling, very recently, at a level close to the highest it's been since the 1980s. A housing correction is likely to bring that ratio down to more average levels, Petramala said. She'd be concerned if prices were to keep growing for another couple of years. Affordability would worsen, and people could end up racking up more debt to buy more expensive housing. But with home sales dropping as they have, that doesn't seem likely. "Right now, [a price decline] would alleviate some of the worries that you would have about a financial crisis," Petramala said. "Whereas if it were to continue, we would be worried about a financial crisis." Babcock has mixed feelings about a crash, even if she admits she's excited for one. Presented with numbers indicating what could happen in the event of a serious crash, she said she would be "very sad" if people lost their jobs. But, like Petramala, she thinks a downturn in house prices could be good for B.C. and Vancouver long term. "Yes, I think construction would slow down, but I also think, if you have more reasonable prices, then there's people like me who need homes still, and will buy them if they become available," Babcock said. "You would have people in my age group [who] would be customers and aren't, and because we can't be."